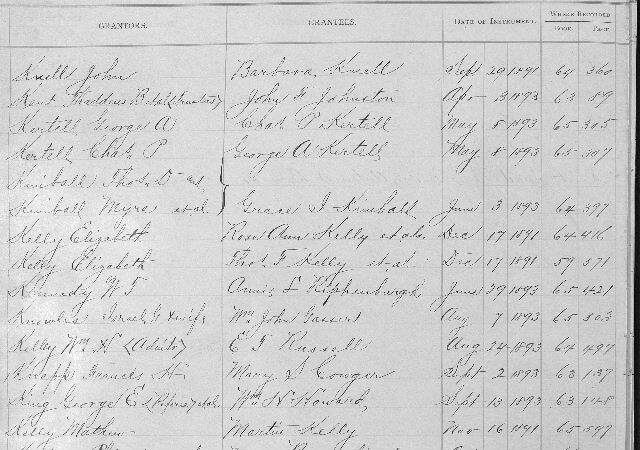 This week’s them for 52 Ancestors in 52 Weeks is the Luck of the Irish. This week I’m going to write about my 3rd great grandfather, Martin Kelly, and his brush with the law. Martin Kelly was a native of County Roscommon, Ireland, who came to America during the Potato Famine. I don’t know much about him until he and his wife, Catherine Dolan, appear in Manchester, Hillsborough County, NH in 1849 where their first child, my ancestor, Margaret (Kelly) Jones, was born. They left soon after for Boston, MA and were on the road again, so to speak, heading for San Francisco where they settled permanently between 1853 and 1856. Martin Kelly owned a saloon and a horse trading business on Jessie Street at first. Then, he expanded into boarding houses on Mission Road (now known as Mission Street). He owned various properties in San Francisco, San Mateo, and Half Moon Bay. The listing below is one of several entries I found in property records for San Francisco County and San Mateo County records referring to Martin Kelly. This one also lists his son, Matthew. Kelly owned the Six Mile House and Seven Mile House on Mission Road until his death in 1899. He may have owned others. The mile houses were designed to tell travelers how far they were from San Francisco’s City Hall. Seven miles was a long way back in the 1880s. You’d need a place to spend the night or at least to get a meal before you headed into the city. That is until July of 1890. On the 7th of July, Martin Kelly was taken into custody for shooting a man in the back. This article states it happened at the Five Mile House which was owned by his daughter and son-in-law owned. Mary (Kelly) and Frederick Meincke ran the establishment on Mission Road at Silver Avenue as early as 1889. A later articles show that the name of the boardinghouse is an error. As you can see from the article, there was some sort of quarrel over money (things never change, do they?) Kelly got mad and shot the man in the back near the shoulder blade. He was taken to his home where a surgeon removed the bullet. It turns out he lived near the boardinghouse, so they were very familiar to each other. Hammerschlag sees it differently. He claims he told Kelly he couldn’t pay him back just yet. This angered Kelly who hit him in the head with a bucket. He had a black eye to prove it! The reporter professes Martin Kelly’s good reputation over Hammerschlag’s somewhat seedy past. Hammerschlag had brushes with the law over shady business practices. So, how did this all end up? Did Martin Kelly go to trial, get convicted, and serve time for his reckless and aggressive behavior? Not exactly. In an article that I don’t have a copy of published a couple of days after the shooting, authorities decided not to charge Martin Kelly. It was determined that his victim was of a bad character, ran a disreputable slaughterhouse, and owed many people money. They concluded that he probably deserved getting shot. 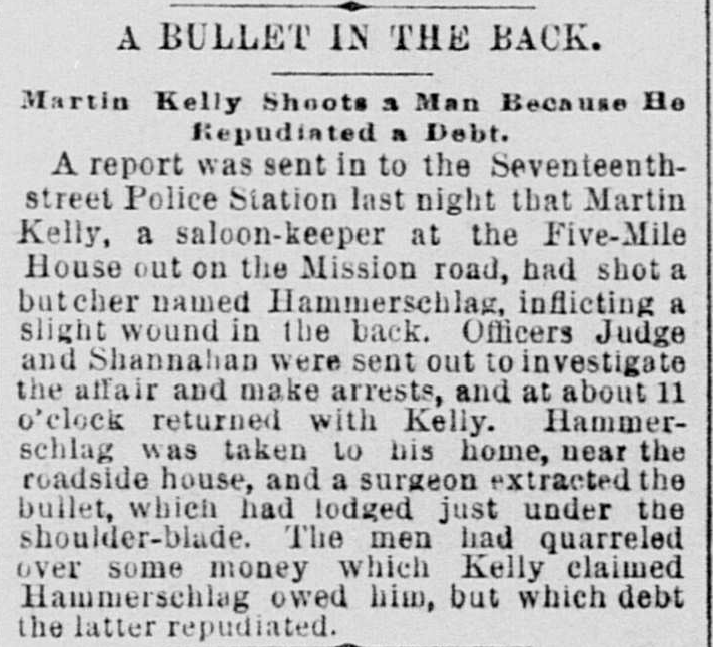 Martin Kelly’s good luck turned out to be bad luck for John H. Hammerschlag. Officials had been investigating practices at his slaughterhouse business. A little over two weeks after the shooting they went after him. 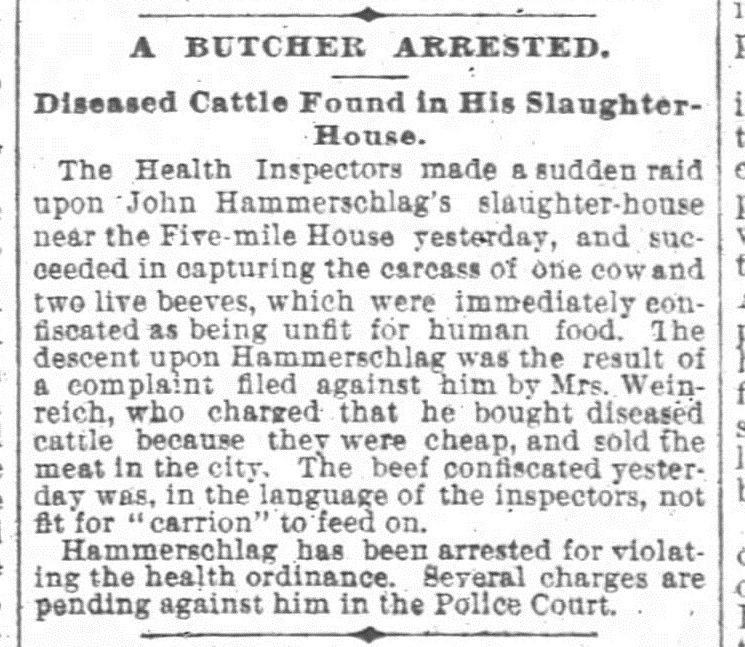 The 31 Jul 1890 the San Francisco Chronicle reported that Hammerschlag’s slaughterhouse was raided and he was arrested. He was accused of selling diseased meat in the city. July was not kind to Mr. Hammerschlag. As far as I can tell, Martin Kelly didn’t shoot anyone else. At least, I haven’t found anymore references in newspapers. Note: This is where newspapers are so important to my San Francisco research. Property records are hit and miss. Where there might be an index, the real records have been lost. The second article helps me put Martin Kelly’s ownership in proper order. It says he owned his establishments for 20 years. I find this fascinating because he lived elsewhere in the 1870s (on Jessie and Minna Streets) running other boardinghouses. I feel I have only touched the tip of the icebergs concerning how much property my 3rd great grandfather really owned.